Before and after the fall. Nokottasu (also generically referred to by Prima as "Turtles") are pudgy, giant Koopa Troopas found only in Mario & Luigi: Superstar Saga. They are cross-eyed and have oblong shells which extend up from their backs, behind their heads. They block certain paths in the Beanbean Kingdom and recite the line, "Derr... No matter what you hit me with, you can't knock me down. ...I think." They cannot be stomped; however, Mario's Dash technique can knock them down, forcing them to move aside. One also appears in a house in Beanbean Castle Town. In Mario & Luigi: Superstar Saga + Bowser's Minions, they have been replaced with ordinary Big Koopa Troopas. Nokottasu From Nokonoko, Koopa Troopa's Japanese name, and possibly tatsu, meaning stand. ↑ "A giant Turtle blocks the passage to a cave to the right of the watering hole. (And, no, the Hammers the boys receive won't do the trick.)" 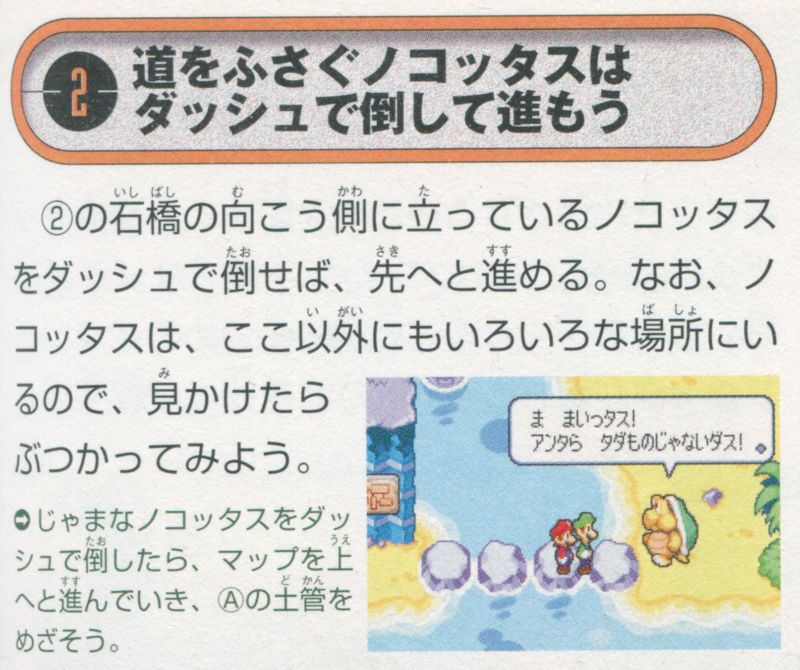 - Mario & Luigi: Superstar Saga Prima Official Strategy Guide. Page 58. This page was last edited on April 22, 2019, at 09:47.